For me as a kid, nothing was as big of a bummer as being served Hawaiian pizza. “Leave the fruit in the bowl”, my father would say, and that’s just what I did by painstakingly removing all pineapple from each pizza slice before sinking my teeth into it. As an adult, I still don’t care much for Hawaiian pizza but I have a better understanding the concept. After all, pairing a little sweetness with something salty like bacon or ham can produce delicious results. But instead of overloading on the pineapple, I prefer to use only a little, judiciously added at just the right time, to add that hint of sweetness to something tart. 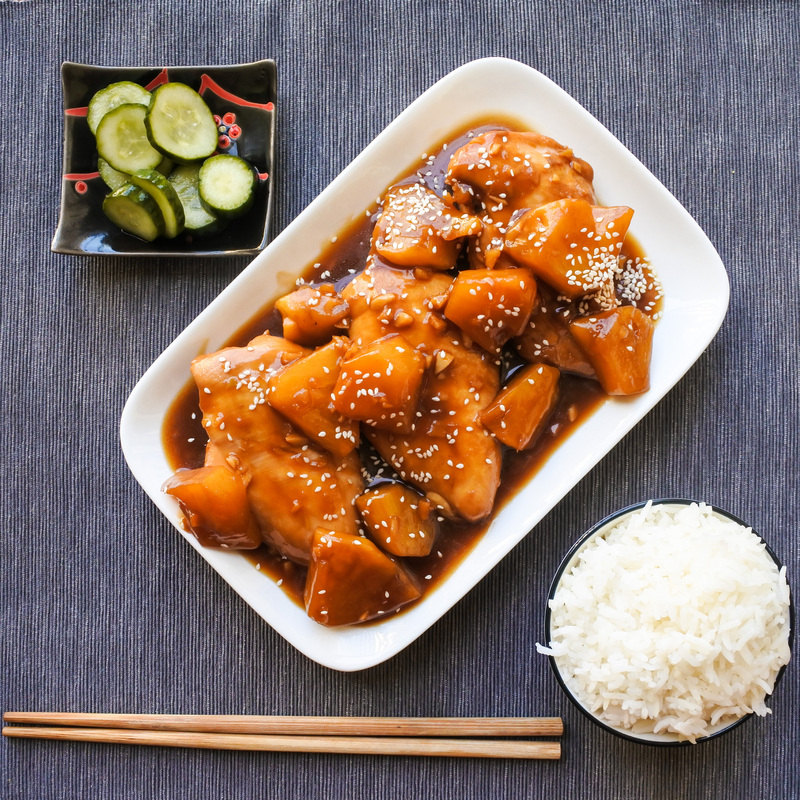 The end result: the pineapple is salty sweet from the soy sauce, cooking wine, garlic, ginger and a touch of sesame oil and combined with juicy chicken breasts, it is pure heaven. 2 tsp of water mixed with an ounce (30 ml) or so of water. Combine soy sauce, cooking wine, garlic, ginger and water. Add to a large lidded skillet or pan and bring to boil. Once at a boil, add chicken breasts and pineapple to bubbling sauce and submerge as best as you can. If that is not possible, simply flip them on the other side half way through the cooking (about 10-15 minutes). Add 2 tbsp of sesame oil to the chicken and sauce. Reduce heat to low or medium low (whichever keeps a consistent simmer going), cover and cook until chicken has cooked through. Should be about 20-30 minutes. When chicken is done, add the cornstarch mixed with water and stir into sauce. Let bubble for a minute or two until sauce has thickened. When sauce is thick, turn off heat and serve. Garnish with sesame seeds or chopped scallions and serve with steamed rice and sesame green beans. For juicy and tender chicken breasts, try to brine your chicken overnight to prevent them from drying out in the cooking process. I use 1 tbsp of sugar and 1 tbsp of sea salt with 2-3 cups of water (mixture should taste like a salty soup), mix it all together and let the breasts soak overnight in the solution. If you choose not to brine, that is fine. You just need to be vigilant in the cooking process so that your breasts are not overcooked making them dry and chewy. To help prevent this, use a meat thermometer. Chicken is safe at 165F/75C. When sauce is thick, turn off heat and serve. Garnish with sesame seeds or chopped scallions and serve with steamed rice and sesame green beans. Once at a boil, add chicken breasts and pineapple to bubbling sauce and submerge as best as you can. If that is not possible, simply flip them on the other side half way through the cooking (about 10-15 minutes). Add 2 tbsp of sesame oil to the chicken and sauce. Reduce heat to low or medium low (whichever keeps a consistent simmer going), cover and cook until chicken has cooked through. Should be about 20-30 minutes.